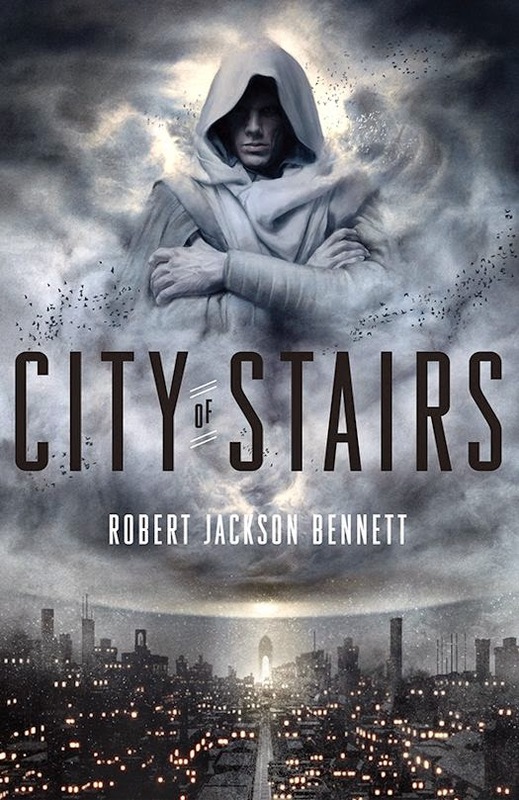 City of Blades is the second novel in The Divine Cities series by Robert Jackson Bennett following City of Stairs, which was my favorite novel of 2014. General Turyin Mulaghesh is forced out of retirement and sent to Voortyashtan. If you've read City of Stairs (and you really really should) you've already met Mulaghesh. Mulaghesh is tasked with finding out what happened to a Saypuri operative who is missing though Mulaghesh's cover story has more to do with pensions than missing persons. Once there Mulaghesh finds that everything is much worse than expected. She encounters her old commander, General Lalith Biswal who is in command of Voortyashtan, and Signe Harkvaldsson, a Dreyling who is overseeing the clearing of the harbor so it can be used again and is the daughter of Sigrud (who played a pivotal role in City of Stairs). A strange substance with potential useful properties has been discovered - thinadeskite - and Mulaghesh wonders about it and whether it is divine. Mulaghesh is fabulous and difficult. 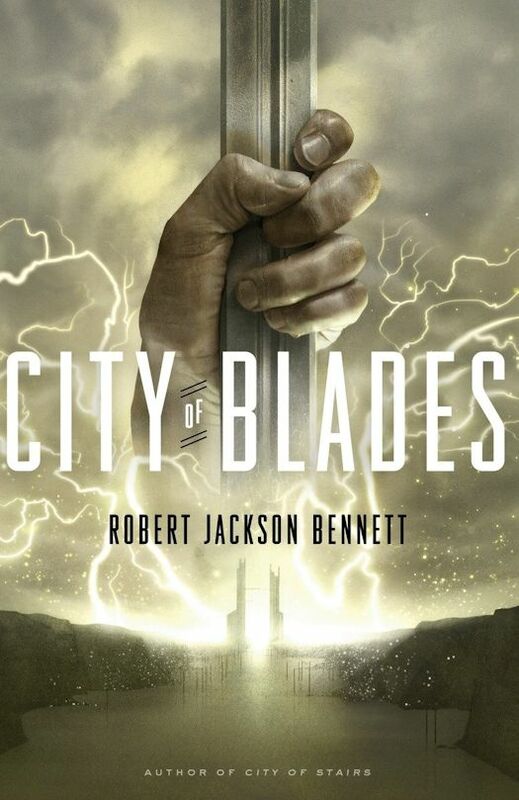 In City of Blades Bennett shares much more of her story and what she has been through that makes her who she is now. She is complex. I really love that Mulaghesh is an older woman who has literal and figurative battle scars, has the skills needed to figure out is going on and will get the job done no matter the cost to herself. I did not have quite the same degree of wonder as first time I was introduced to the divine, the Blink, and more, but City of Blades does not disappoint in the slightest. The wealth of worldbuilding continues and the mythology of the divine Voortya is fabulous and frightening. The mystery that Mulaghesh has to solve takes many unexpected twists and turns. There is so much going on for Mulaghesh to sort through, but Bennett brings all the pieces together beautifully. As in book 1 issues are raised about cultural and religious suppression and more, but City of Blades deals with a different divine entity - a war and death goddess and the afterlife that she had promised her followers. This is utterly fascinating. Bennett's has created characters who are unique yet deeply relatable. There is so much emotion in City of Blades, along with action, outstanding and thoughtful worldbuilding and a great story. City of Blades is superb. An atmospheric and intrigue-filled novel of dead gods, buried histories, and a mysterious, protean city--from one of America's most acclaimed young SF writers. The city of Bulikov once wielded the powers of the gods to conquer the world, enslaving and brutalizing millions—until its divine protectors were killed. Now Bulikov has become just another colonial outpost of the world's new geopolitical power, but the surreal landscape of the city itself—first shaped, now shattered, by the thousands of miracles its guardians once worked upon it—stands as a constant, haunting reminder of its former supremacy. Into this broken city steps Shara Thivani. Officially, the unassuming young woman is just another junior diplomat sent by Bulikov's oppressors. Unofficially, she is one of her country's most accomplished spies, dispatched to catch a murderer. But as Shara pursues the killer, she starts to suspect that the beings who ruled this terrible place may not be as dead as they seem—and that Bulikov's cruel reign may not yet be over.